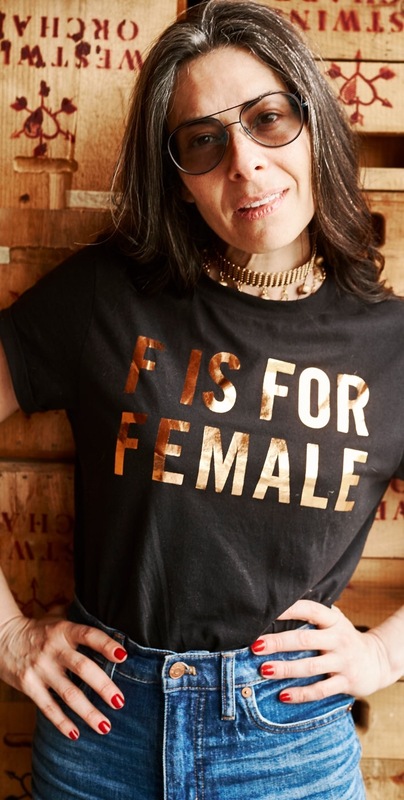 Ever since her inaugural episode of TLC's What Not To Wear, Stacy London has been redefining the rules of style. And the rules are - there are no rules. Rules change depending on the woman and there is not a single definition of style or beauty. A kind-hearted hardworking and empowering force for women, Stacy London is a testament to the fact that we should never throw in the towel. A: Brooklyn NYC but I grew up in Manhattan. I lived at 110 Bleecker Street until I was 9. I still love to sit on the wall by the flags directly across from that building just to look at it. It brings back SO many childhood memories. A: Never trade the thing you want most for the thing you want now. A: Weird, nerdy, vaguely amusing. A: One favorite song is too hard. I have 3. Deal with it. What can a say I'm a cynical romantic. A: I got my big break when... I was hired to be on TLC's What Not To Wear. A: The Trolls soundtrack and Frank Ocean. A: I've always felt "other." Having a skin disease at 4 can do that to you. The treatments made my skin split and I have a bunch of deep scars. But those are badges of honor now. They remind me what I've been through. And almost 9 months ago, I had a kind of spinal reconstruction surgery. That has made me feel more than other. The rehabilitation has been hard. And knowing I'm filled with titanium makes me feel like a super weirdo. A: When I wake up I yawn, stretch my left Achilles heel, and get oodles of kisses from my puppy, which is just her way of telling me it's time to feed her. A: Well everyone knows I love dinosaurs and Star Wars so hmmm, I know! I have a new purchasing rule: if I buy one new piece of clothing, 2 older pieces have to come out of the closet and get donated, given to friends, or to one of my sales to benefit charities (mostly Animal Medical Center of NYC.) (Also, completely unrelated, I really love an Aperol spritz. But with soda and not prosecco. Less sweet, and all the bubbles. A: I almost gave up after I was fired from Mademoiselle magazine. I thought my career was over. But just a few months later, I got a call to audition for a show called What Not To Wear. That was that. A: The future is female because the world needs to heal. It needs understanding, nurture, structure, tolerance, a strong but kind hand, protection, and diplomacy. A woman is able to accomplish all these simultaneously and instinctually. The future is female because it is inevitable.